It is Paper Plate Whirligig Time again. 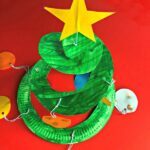 I think the last Paper Plate Twirler we did, was our Paper Plate Dragon Twirler! Or was it the Love Bug Twirler?? Either way, it has been a while!!! 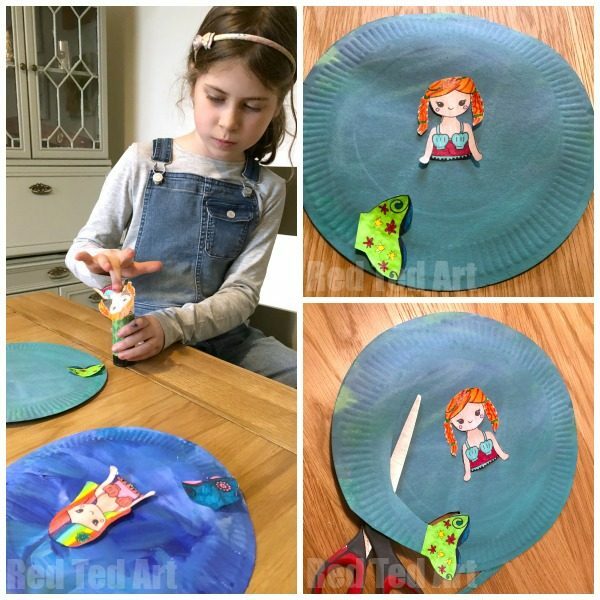 And with Summer and lots of lovely Summer Crafts for Preschoolers heading our way we thought a Paper Plate Mermaid Twirler may be JUST THE THING!! 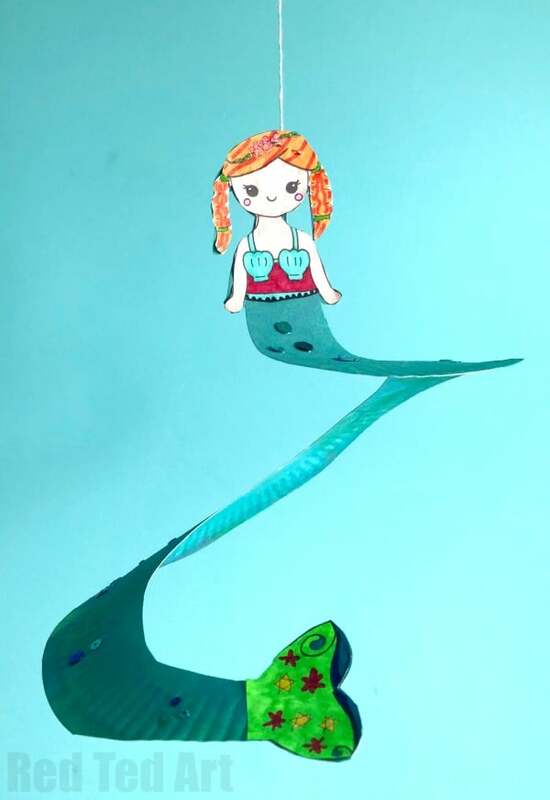 I have once again created a FREE Mermaid Printable for you – but you can of course draw your own mermaid for this Mermaid Whirligig. So choose to use the template or draw your own! 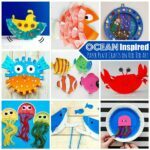 We adore Paper Plate crafts for kids. 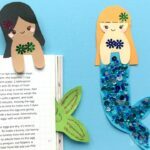 This little mermaid craft idea, make wonderful Mermaid Room Decor crafts for kids of all ages (my daughter, aged 8, is going crazy over them!!). 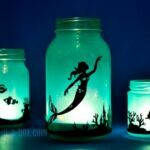 Oh how we adore Mermaid Craft Ideas!! WHY NOT SIGN UP TO OUR NEWSLETTER FIRST? 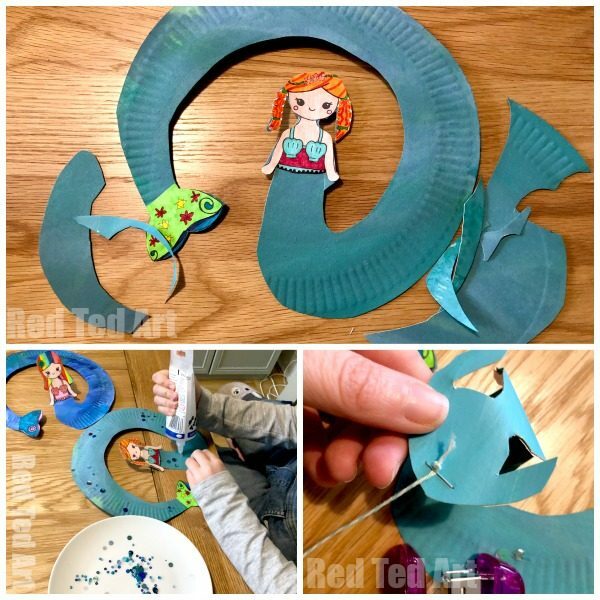 Now the process for making your paper plate mermaid Twirler is ALMOST the same as for all the other whirligigs we have made so far.. but not QUITE – as you need to allow for the mermaid’s printable body. Begin by painting one side of your paper plate in the desired colours. 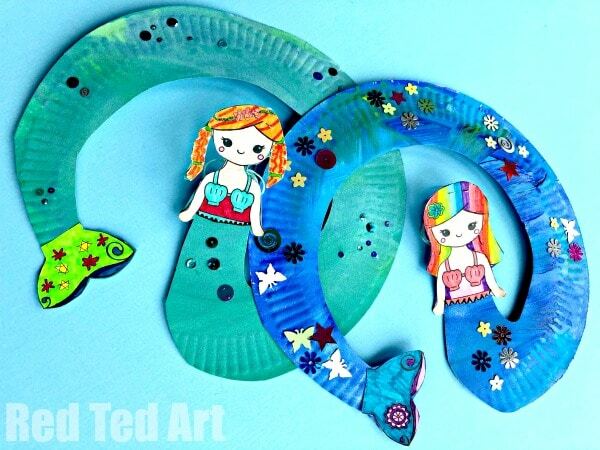 Whilst the first side of the paper plate twirler is drying, you can continue by colouring in your mermaid printables. Once you have completed the colouring, the paper plates will hopefully already be dry and you can turn them around and paint the second side (you don’t HAVE to paint both sides but we do think it is nice!). In the meantime, you can cut out your mermaid printables. 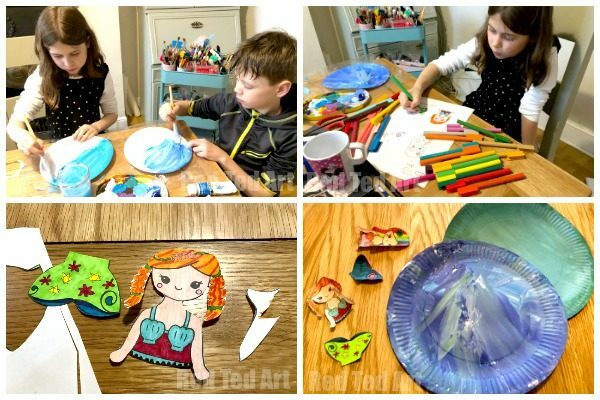 Glue your mermaid’s body to the middle of your paper plate. And the mermaid’s tail perpendicular to left of the mermaid (actually, the right is fine too.. you will simply cut the mermaid out in a different direction). Once these are glued in place, cut out a mermaids tail – beginning at the tip of the mermaid’s tail – and getting “fatter as you come cut round the plate”. See image. Normally you keep cutting the paper plate like a snail. But for this mermaid Twirler, you have to keep the centere in tact for the mermaid’s body – which you now cut out. 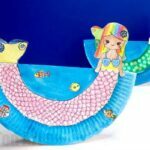 Once cut, you can decorate your paper plate mermaid’s tail with glitter glue or sequents. 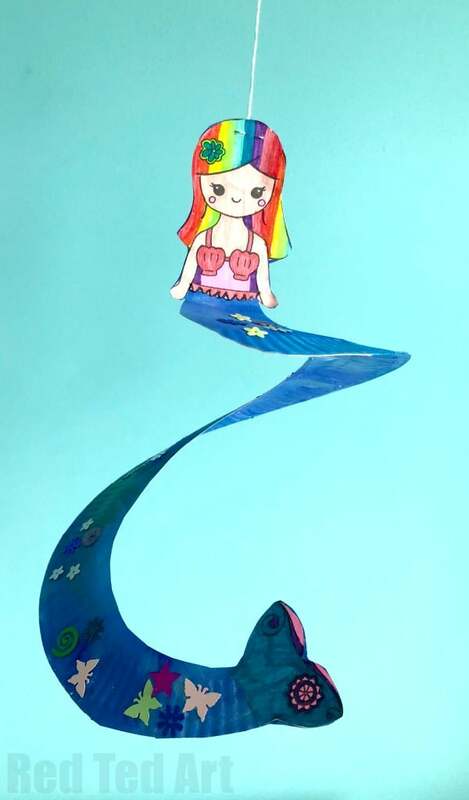 Finally staple or tape on some string to your mermaid’s head for hanging. 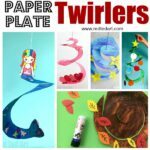 Your Paper Plate Mermaid Whirligig is complete! where is the link to the printable? So sorry! Have added it now! 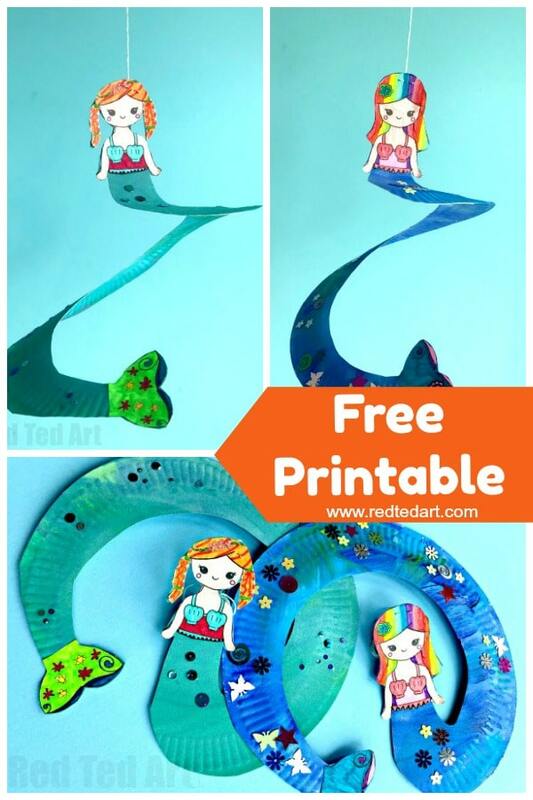 I couldn’t find the link to the Paper Plate Mermaid Whirlygig print? Thanks for all your inspiring ideas. Oh my! So sorry! Have added it to the post now!! 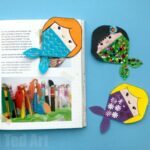 I can’t find the link for the printable- can you tell me which part of the page it is? You click on the BIG RED button that says “Click for your printable”? Sorry, I didn’t see it before- maybe the page wasn’t fully loaded.